According to UNHCR, the number of displaced people formally registered by local authorities since May 2 following the military’s offensive in Lower Dir, Buner, and Swat, has surpassed 1.7 million. About 200,000 of this number are in camps, while the rest are staying with their families and friends or in schools and other communal buildings. According to the front page of the Washington Post yesterday, the crisis is the largest exodus since the 1947 Partition of India and Pakistan. As the crisis worsens, numbers of the displaced are shifting into Pakistan’s provinces and main cities. However, while PML-N leader Nawaz Sharif announced today [just prior to the Supreme Court lifting his election ban] that IDPs from Swat “would be welcomed in Punjab,” adding, “Prohibiting affectees to enter another province is a violation of basic fundamental rights and national interests,” the influx has become an increasingly politicized issue among Sindh’s nationalist parties. 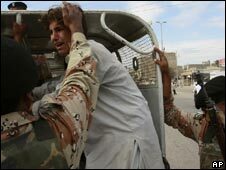 Yesterday, shops in Karachi remained closed after members of the Jeay Sindh Qaumi Mahaz (JSQM), a movement that promotes the cause of natives of southern Sindh province, called a strike to protest the arrival of IDPs in Sindh. It was the second strike called by the JSQM. A similar protest also occurred on Saturday. Although the “Talibanization of Karachi” has continuously been cited as reason for these strikes and demands, the underlying issue goes far deeper, relating also to the power politics of the province. While ethnic tension between Pashtuns and Sindhis is not a new phenomenon [riots between the groups began in the mid-1980s], the recent rise of immigrant Pashtuns into the province, particularly in Karachi, have sparked increased violence and unrest. 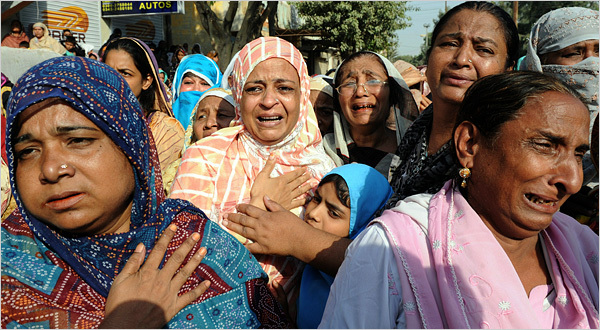 In November 2008, more than 40 people were killed and hundreds were wounded in two days of ethnic-related killings, [see related post by CHUP’s Karachi correspondent]. This is not to say the Taliban threat in Karachi is not an issue. In fact, the rise of Taliban influence in Pakistan’s urban areas, particularly in Karachi, is something I recently wrote about, and should be cause for concern. For the MQM to request that the IDPs be registered is both a legitimate and responsible demand. 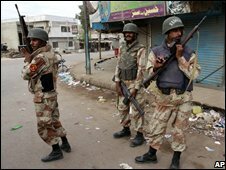 However, given Karachi’s history of ethnic tensions and violence, the MQM’s stronghold in the city, as well as the recent statement by Abdul Wahid Aresar, head of the JSQM, who asserted, “We don’t see it as just an issue of helping the displaced people. The motive behind their arrival in the southern-most part of Pakistan from the north is to marginalize the native Sindhis, which we will resist,” the matter is far from simplistic. What is sad to me is that the humanitarian crisis in Pakistan is Pakistani. It’s the result of an internal war within our country, and the victims are our people. The collateral damage should therefore evoke a unified, national response. And to be fair it has, at least among the civil society [see Deadpan Thoughts on Pakistan’s civilian response to the conflict as well as Teeth Maestro’s inspirational journey to the camps]. But the devolution of the issue into a politicized power struggle is indicative of the broader reality that exists in our nation – that, at the end of the day, many will allow provincial, ethnic and religious divisions to cloud their judgement of what is humane, what is right, and what is good for Pakistan. For CHUP’s other posts on the IDP crisis, [including ways you can help] click here. Also: Many, many thanks to the Karachiites who allowed me to pick their brains on this issue on Twitter. Finally: A small note – the BBC mentioned CHUP today in their coverage of Pakistani blogs mobilizing for Pakistan’s refugees. Teeth Maestro was also mentioned, which is fantastic. There are so many other blogs that are doing so much to raise awareness on the crisis (Deadpan Thoughts, The Swat Plea via Teabreak, Chowrangi, the list goes on), and it’s been incredibly inspiring to be a part of this community.